Now I know I said the last annunciation was the last one but this really is it as I know what my last 8 blog entries are going to be and I have got myself organised finally. Heavens, you'd think after 6 years worth of Blogvents I'd know what I'm doing by now, but apparently not. Anyway, on with today's entry and we have returned to one of my favourites, and I know from the emails I get, you lot love him too. Hurrah, it's the Framp! You'll remember from this post that we love a bit of Framp over here and really appreciate his watercoloured medieval ladies that seem to cry jewel-hued tears into pretty landscapes. 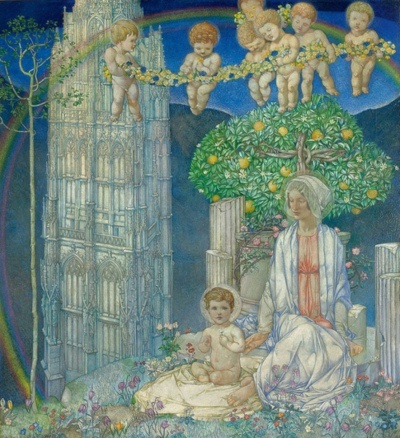 Frampton's Marys are pale lilies and irises, the top one blending with her flowerbed in shades of blue and the bottom one growing up towards the light. Even more odd is this one, very spare and minimal but resplendent in details hinted at. 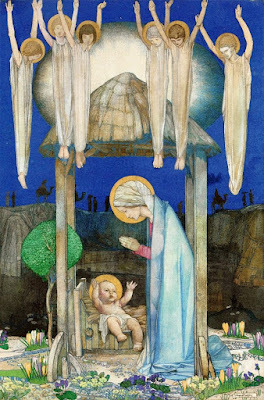 Mary kneels before a charming little Jesus in the tiniest stable ever. The skinny little angels circle round doing a celebratory rendition of 'YMCA'. In the distance, in silhouette, wise men on camels approach, together with other figures. Are they the shepherds? Did the Three Wise Men have servants? If they really were Kings, I can't believe they would rock up without any sort of entourage. Anyway, I especially love the crocus, breaking through the frozen ground to mark the renewal of the world, the renewal of faith and the renewal of life after winter. In golds, blues and greens, Mary, Jesus and the angelic hosts show the defining moments in Mary's story from miraculous conception to birth. 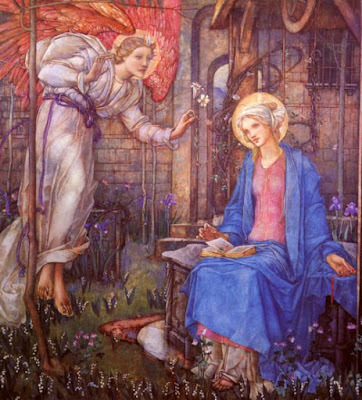 Mary seems to remain the same but the angels interestingly change, from a beautiful Gabriel with rose wings, to chubby, flower-toting babies and narrow beams of holy light. As always, everything changes and still stays the same.